Set in the centre of Alberta’s energy and agricultural heartland, Strathcona County is a young, successful and vibrant community of more than 92,000 residents. With a focus on social, environmental and economic sustainability, Strathcona County is committed to balancing the unique needs of its diverse community. A Community Energy (District Energy) System started servicing Strathcona County’s `Centre in the Park` development in fall 2006. Hot water is distributed throughout the development, supplying thermal energy to up to 24 customers such as County Hall, Kinsmen Pool and new City condo developments. The Community Energy Centre is located adjacent to the Centre in the Park development. This central location requires the Energy Centre to blend in architecturally with the new developments. 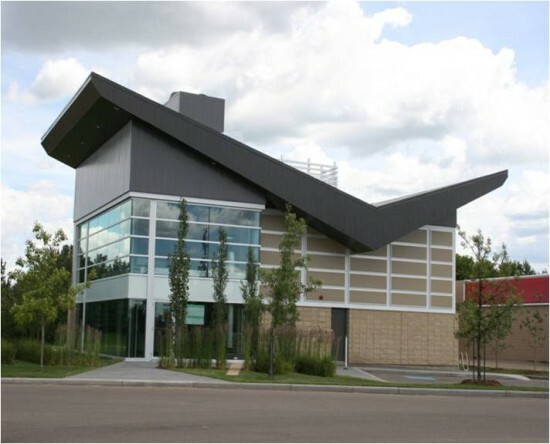 The key reasons behind Strathcona County’s pursuit of a Community Energy System are: (1) To launch a new infrastructure in the downtown core that provides highly competitive, efficient and environmentally sustainable thermal energy. (2) To position themselves to fuel switch easily. (3) To reduce local air emissions. The district energy system reduces greenhouse gases by 1,100 tonnes per year. FVB has been involved in the project from the very first feasibility study to the final detailed design of the Energy Centre, Piping and Building connections, as well as the marketing of the service to customers. Initially, natural gas fired high efficiency boilers were used to supply heat. Later, FVB completed the design of an interface for the utilization of a biomass module which will further reduce Strathcona`s carbon footprint. Since October 2012, the biomass combustion boiler has served as the primary heat source for the system, adding renewable energy into the district energy system while reducing greenhouse gases by an additional 1,200 tonnes per year.